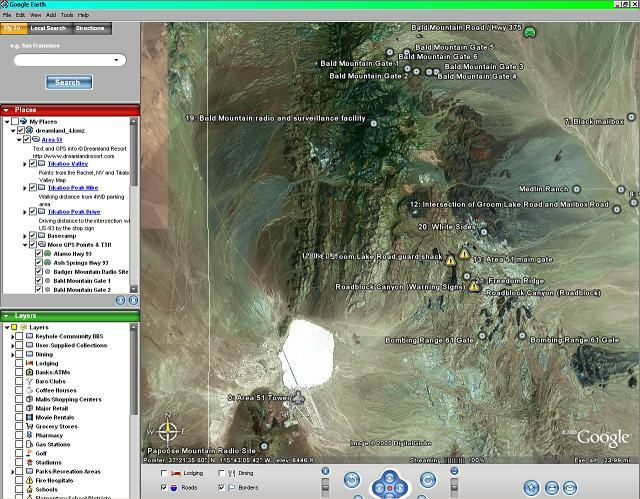 This Area 51 plugin for Google Earth includes Area 51, TTR, Basecamp, some of the Gates, View Spots and other Places of Interest around Area 51. It was created by our reader Andrew Jones. © 2005 Dreamland Resort. Absolutely no publication of this program anywhere outside the Dreamland Resort web site. This plugin requires Google Earth to be installed on your computer. Click here to download Google Earth for free. To install the plugin, click on the download link below. Then choose "Save" to save the plugin to your computer, or "Open" to install it. If you save the file to your computer you can double-click it later to install. If you select "Open" Google Earth will automatically be launched with the plugin in the "Temporary Places". To install it permanently, simply drag dreamland_4.kmz from the "Temporary Places" menu to "My Places".